Now available and brand new for 2018, we're now offering stunning arcade machine hire for events and weddings throughout the South West! Our machine has authentic decals, offering that retro look, and also has all the classic video games from the day running through the MAME emulator, and all easily accessible through a Hyperspin friendly front-end interface. Plus there's no need to keep feeding it those old 10p pieces because it's all set to free-play! It is supplied with hundreds of games, including all the favourites* like Pac-Man, Galaga, Donkey Kong, Star Wars Ms. Pac-Man, Dig Dug, Asteroids, Defender, Tron, Centipede, and if you have an absolute must-have, then just let us know when booking, and we'll do our best to make sure it's included on the day. A fun addition to any party whatever the age group, and also perfect as a feature for corporate events, and help in keeping your guests entertained throughout the evening. Please get in touch to discuss availability, pricing and delivery. 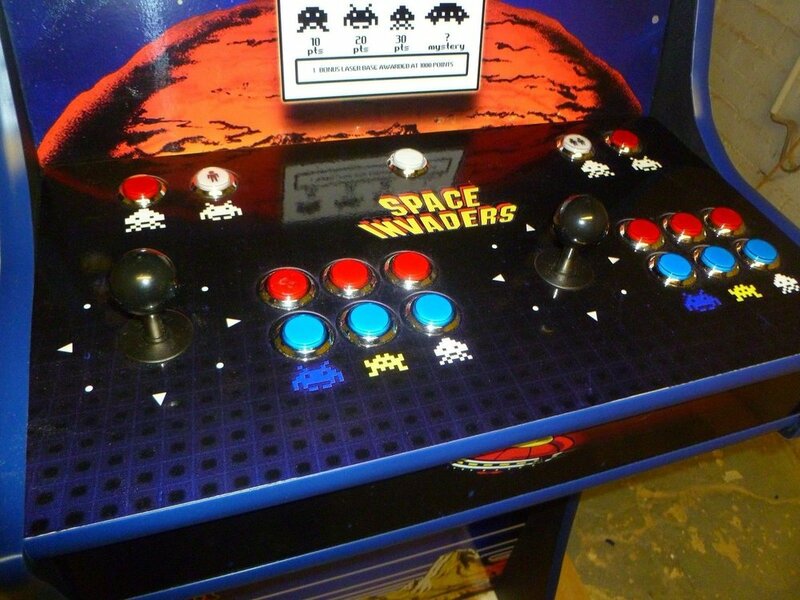 We can deliver arcade machine hire to Gloucestershire, Wiltshire, Herfefordshire, Somerset, Bristol, Worcestershire, and nationally around the whole of the UK. We constantly seek new ideas for events, and this time we were inspired by one of our many trips to the unbelievable and amazing Arcade Club in Bury, Cheshire, home to hundreds of GENUINE retro arcade machines. If you have an interest in retro arcade gaming (or even if you don't), we highly recommend a visit!! Also, coming soon! We'll soon be offering a classic looking table top model too! All our hire items may be subject to a deposit payment to cover damage, and at least 2 forms of personal ID may also be required. All hire items are subject to our hire terms and conditions (available on request), and you are also responsible for loss of damage to any item. * All trade marks acknowledged. You can click here to chat to us live, or fill in the form below and tell us something about your amazing event. Don't forget to mention when and where you are holding it, what it is, why it's special, and what your looking for regarding your mobile DJ, plus the music you love, and anything else you feel is relevant. We'll get back as soon as possible with some great ideas and prices.